All this time I am wondering if we should give up and turn back, but Bama refuses. When the trail mercifully levels out, I stop to fix my eyes upon the heavens, admiring the multitude of stars that fill the midnight sky. I recite several lines from a psalm and say a prayer for my companion. On the crater rim, we bundle ourselves against the cold and wait for the sunrise. 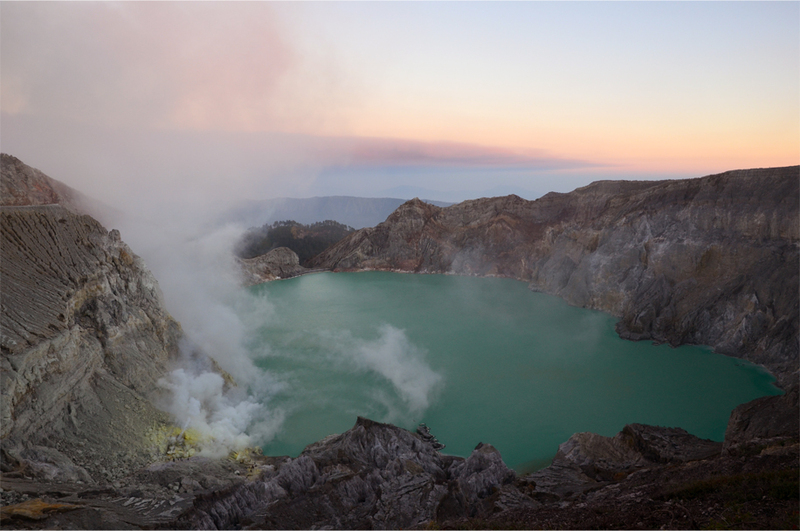 From our perch I can make out the darkened mass of Kawah Ijen’s highly acidic lake – the largest in the world – and surreal wisps of blue flame far below. Many of our fellow hikers venture down into the crater for a closer look, but it is a risk that Bama and I are not willing to take. 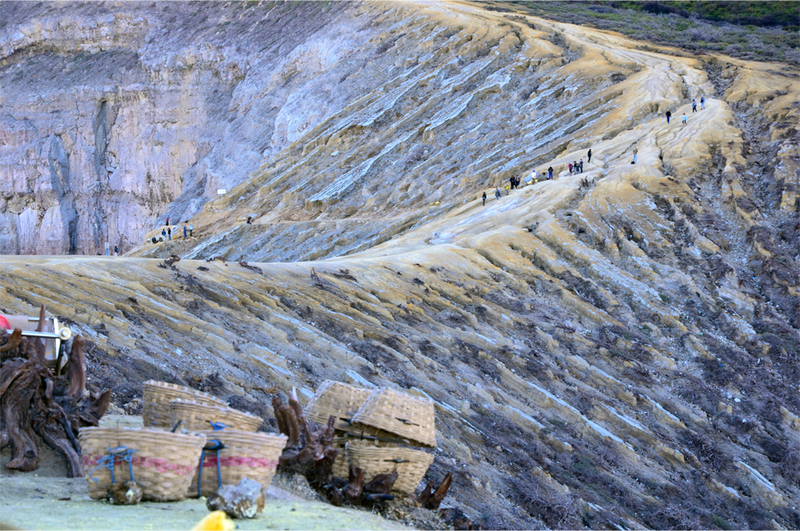 Kawah Ijen has gained some notoriety as a hazardous workplace for nearly 300 local men. With wet scarves as their only protection against the clouds of caustic gas, they harvest the crater’s precious sulphur both day and night. In its molten form, the material pours out from a series of pipes connected to an active vent above the lake. 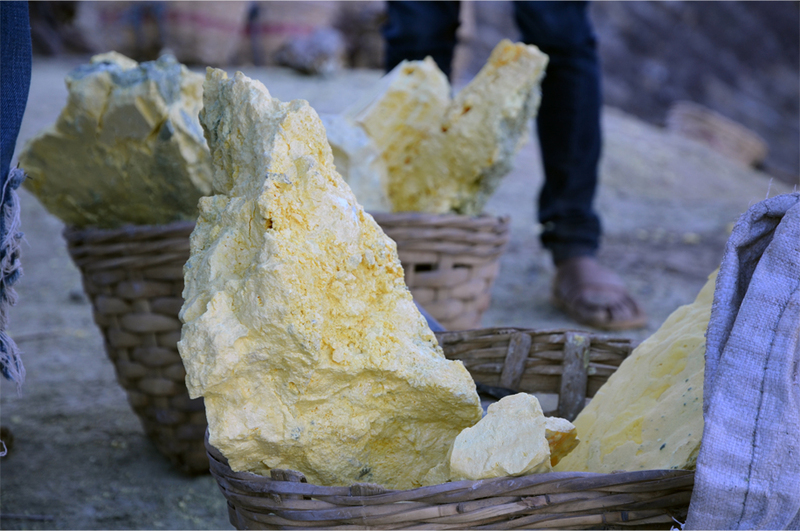 Once the sulphur cools and hardens it is then broken into chunks, loaded into baskets and carried down the mountain to a factory. The sulphur miners come twice a day, slinging 70-90 kilos across their shoulders on each trip for a pittance – every 10 kilos will get them 10,000 rupiah (74 cents US) at the factory, where the sulphur is melted again. For extra income, some miners pour the liquid sulphur into moulds, creating pale yellow turtles and other souvenirs for the stream of tourists who come to the crater. Sea of cloud in the sky, so amazing!!! It was a gorgeous sight. I guess I walked too fast that morning, sorry for that and thanks for the prayer! I’m glad that we did see the blue fire, even though we were high up on the crater rim. 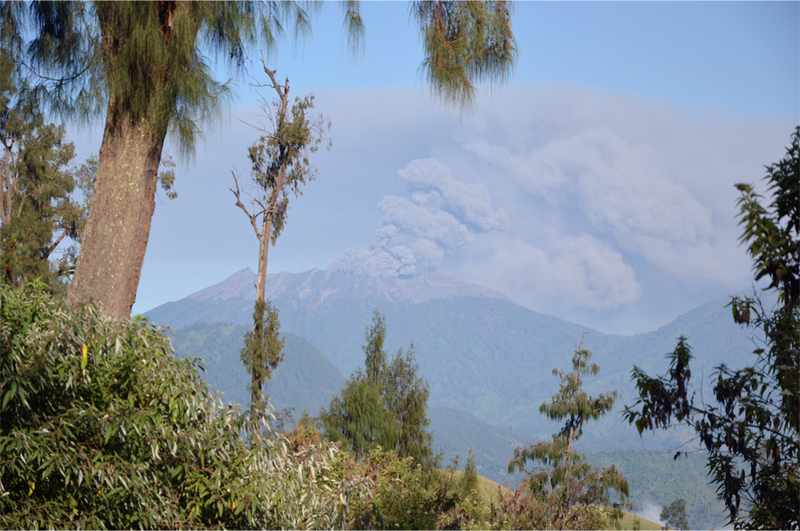 But the most memorable experience of the hike was seeing Mt Raung erupting. No worries, Bama! I was more concerned with your nausea than my own breathlessness (being out of shape and all). 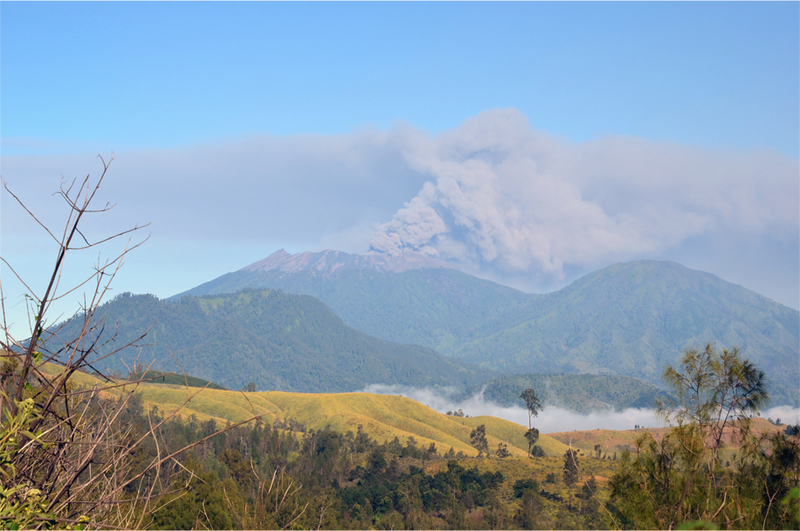 And yes, it was exciting to see Raung spewing out a thick plume of ash! Agreed, Winny. It would have been nice to stay longer at the crater. I feel for the workers there. Such hazardous hard work for so little money 😦 Thank you for sharing! It really puts things in perspective. Any gripes I had about working in my previous jobs seem so tiny in comparison! It was also humbling and thought-provoking. Visiting in the daytime would have given me very different photos – the crater lake is a brilliant shade of turquoise in the sun. Seems that worldwide (and throughout history) the people who physically work the hardest earn the smallest amount of money. A sad but true statement about humanity. Excellent post. Thanks also for steering us to the Compass and Camera blog, another informative blog full of super photos and wise words. You are right, Marilyn – and it speaks to the unfairness of human society as a whole. We are so privileged to have access to good education and many opportunities for work. It has been an eye-opening experience to follow Kelly at Compass and Camera over the past year or so. I especially enjoyed reading her posts on less-visited countries like Oman and Bhutan. 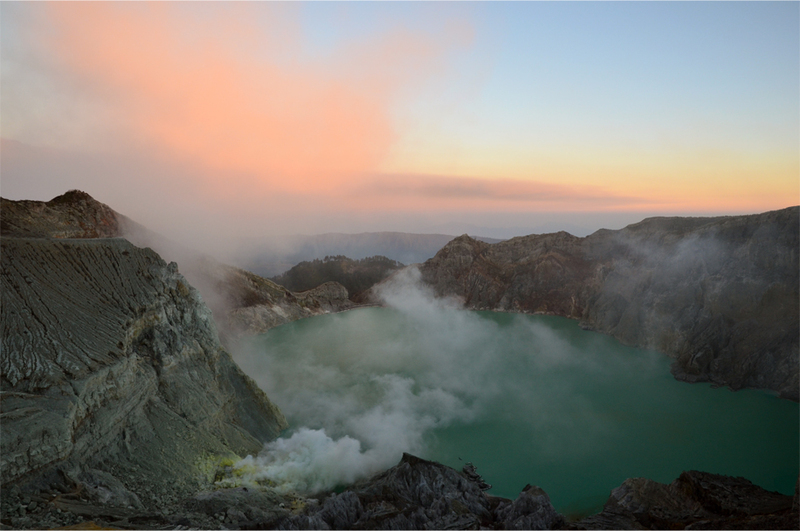 Kawah Ijen is a metaphor for the world and life — so much beauty for the senses, but the price of that beauty is danger and risk. That’s a great observation. I read once that the sulphur miners do the job because it will earn them double what they can get at the coffee plantations lower down the mountain. Coal miners in the U.S. and around the world work in a risky job that has health hazards too—the risk of cave ins, black lung and a shorter lifespan. The milky blue and yellow amidst the chalky-looking rocks, all backlit by the sunrise, combine for a winning bunch of shots! Fascinating info, too. Thanks Lex! 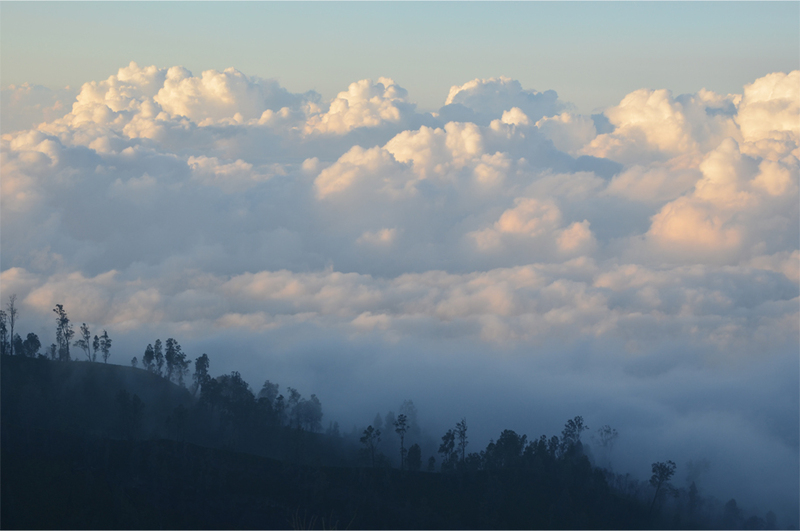 Given your penchant for exploring mountains and high places, I think you would really enjoy seeing Ijen in person. This place hold a special place in my memory. I was there in 2010. My son was also gripped by nausea. Great post. Strange how the fumes seem to affect some people more than others – and Bama was much fitter than I when we went. Gorgeous pics, though the seeing a “kuli” is always a bit saddening. I completely agree – it is as though they are ‘living mountains’. Seeing the miners’ harsh working conditions makes me wonder if there is some way to get them out of the crater and into a better place that will earn them more money. It looks like you had a beautiful sunrise. We had a great time once we got into the crater. There was a wind storm and forest fire the entire way up. I am really surprised they let us walk up! It is amazing that these guys are working so hard and we come hiking through on holiday. I wonder what the miners think of it? BTW, I tried to lift one of the baskets. It was a challenge just to get it on my back and stand there. I can’t even imagine carrying it out. Those guys are so damn tough. That is an interesting question. They must think we tourists are crazy for going to the sulphur mine and taking pictures. I saw someone on the crater rim doing what you did… he seemed fit and strong but clearly the load was a lot heavier than it looked! Yep, the scenery was totally surreal. “The world, as one fellow blogger recently put it, is both a beautiful and terrible place” … Thank you James for really looking at the world ! It’s my pleasure, Juan. Thank you for reading and leaving me a comment! Kelly is absolutely right of course – the world is both a beautiful and terrible place. This post was both heartbreaking and uplifting at the same time – the plight of the miners, and the beauty of the area. Where is it ? Indonesia? Ah yes, I forgot to mention that in the text – you’ll find this place in Indonesia, near the eastern end of Java. Bali is just a short ferry ride from the nearest town (Banyuwangi). We saw people of all ages hiking… you and Don are in good shape so you could go the next time you’re in Bali. 70-90 kilos!!?? Really? How big are those guys? I have a hard time with a 30 kilo backpack. And it smells better. I truly love the shot of the volcano smoking in the distance. 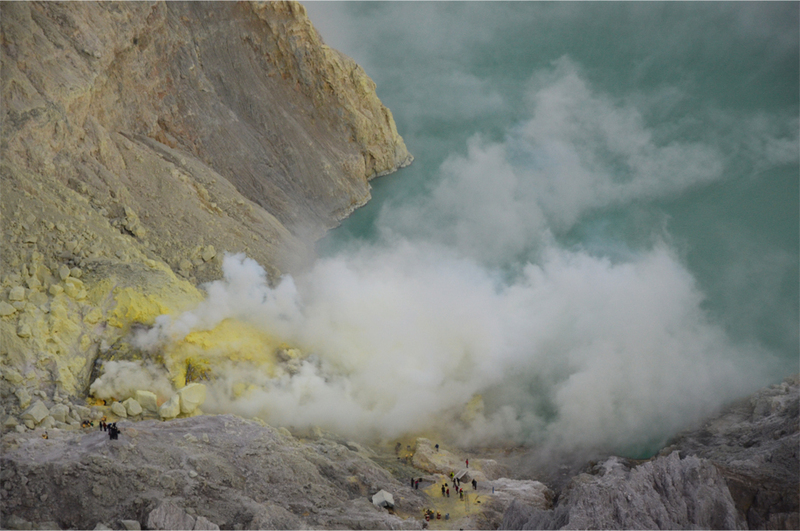 And the first shot of Ijen (how do you pronounce that anyway…I-yen?). And I too, loved Kelly’s line from that post. They don’t have to be big men to carry more than they weigh. It’s amazing what individuals can accomplish when they want to accomplish something like a better paying job. For instance, the Chinese who worked on the Tea Horse Road in China for about a thousand years. That’s amazing. But I have always said nothing is impossible. In fact, I’m writing the second half of a story I posted the first half to, and in the 2nd, I say something just like that…after seeing my gelded horse mount a mare. The guys were not big at all – and one we passed on the way down looked over 50. That was my first sight of an erupting volcano so I ended up taking way too many photos! Oh, Ijen is just pronounced “E-jen”, very simple. Indonesian is a lot easier to read now that the Dutch spelling system is no longer in use. Otherwise Uluwatu in Bali would still be “Oeloewatoe”. Yeah…I guess it’s true…if you put your mind to it, you can do anything. Even change your language back! A real good read, James. You’re welcome, Kelly. 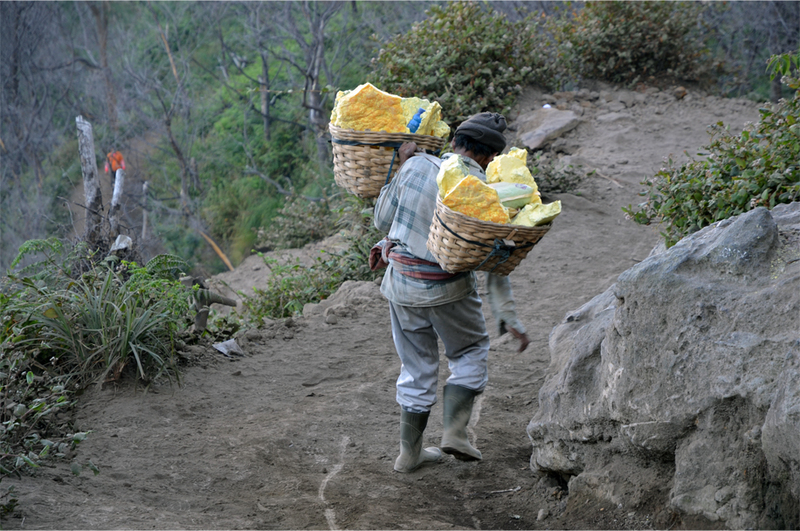 It was humbling to see the miners plodding down the mountain with their baskets of sulphur – we have it so easy compared to what they go through on a daily basis. The quote from your tribute to Asia summed up my feelings perfectly. I once climbed a different volcano in Java, and like you, the combo of waking up well before dawn and the sulfuric fumes (additionally I woke up awfully congested) made the trek up a grueling experience, and feeling so unwell made it difficult to fully take in the surrounding beauty. But still a great experience! Your photos are wonderful; I love the mix of yellow sulfur and turquoise lake. Thanks! That sounds pretty crazy – I might have given up had I been in the same position! 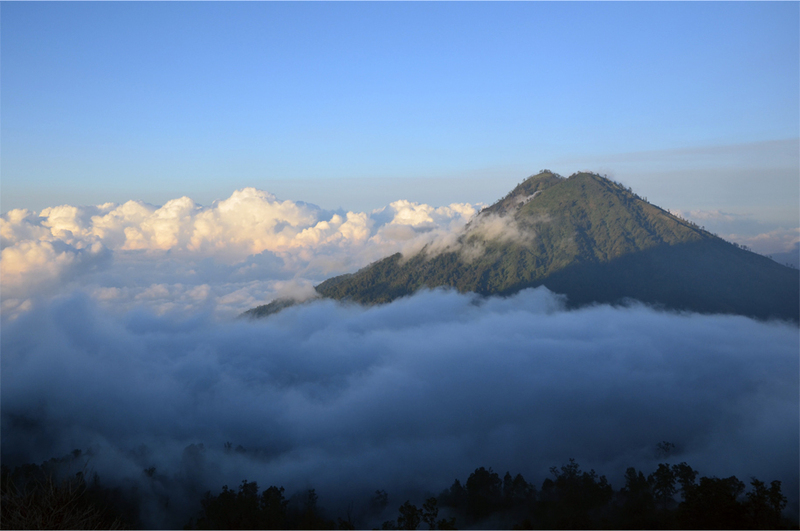 Was it Semeru or Merapi? I haven’t climbed either of those volcanoes, but people say they’re both a real challenge. It was actually Bromo. So, less proper climbing and more excessive whining as I struggled up the seemingly endless steps to the crater’s rim. But still not ideal if you’ve suddenly got a head cold. Sometimes it felt like being on another planet! Looks to be an incredible trip ~ I always wonder in a situation like this, where one travels as a tourist and can come across something so impressive, intriguing but yet notice the people who live there and make a living in less than ideal conditions. As you say, it is a sobering thought and it shows empathy – and interacting within this culture/area is the best respect you can give. You do travel very well James, great post. Thank you so much, Randall. When you do get to Ijen (I have a feeling it is only a matter of time) you will no doubt return with a series of arresting portraits. Words can stir empathy, but pictures that draw us into the eyes of another human being still do the best job. It had to be a wonderful trip and time you could spend there. Thank you for the motivation, because I decided to add this place on my travel list :). It is crazy to think that something so beautiful can be so dangerous. I can’t imagine how difficult it must be for the local miners who have to deal with it all day, everyday. I agree. There has to be some way to get them off the mountain permanently, into a much safer job that pays better. Well, sometimes it felt like being on another planet! Stunning images James! The crater rim looks pretty treacherous. Mount Rante in the distance magical! I guess that beauty is lost on those poor workers. Beautiful terrible world indeed. Thank you, Madhu! The funny thing is, the crater rim never felt dangerous – even if we were directly above an acid lake and persistent clouds of sulphur. The trail there was wide and well-trodden. Yes, it was really an amazing sight.